There is a reason we haven’t gotten around to writing a post in the past year. Kevin took a new job and I was busy bouncing around Virginia and North Carolina completing my clinical rotations for my Physician Assistant degree. Because of the craziness of the past year, this post is dedicated to those who played a large role in my life while on the road. As I moved around each month to participate in different clinicals, I was given the task to find my own housing as our program did not provide it for us. Sometimes I was living with people I knew and sometimes I was living with people I had never met before in my life. Regardless of the type of relationship we had, one thing remained constant: an unremitting generosity. They housed me, fed me, and made sure I was comfortable. Most of all, they believed in what I was working so hard for and gave me an opportunity to pursue this portion of my degree with support, faith, and love. Some people housed me for free. Some made home cooked meals for me. Some included me as part of the family outings. One person gave me some of her hotel points so that I could spend time with Kevin exploring a new city as we only got to see each other every few weeks. One person came to my rescue as my alternator died in the middle of a highway in North Carolina and loaned me their car as mine got fixed. Needless to say, each and every one of them made my life easier. I always racked my brain to figure out how I would ever repay these people for their kindness. One of my new friends from this past year recounted to me how he had been given so much from others in the past and he was glad to finally be in a position to pay it forward. His request: do the same. How have you paid forward an act of kindness? 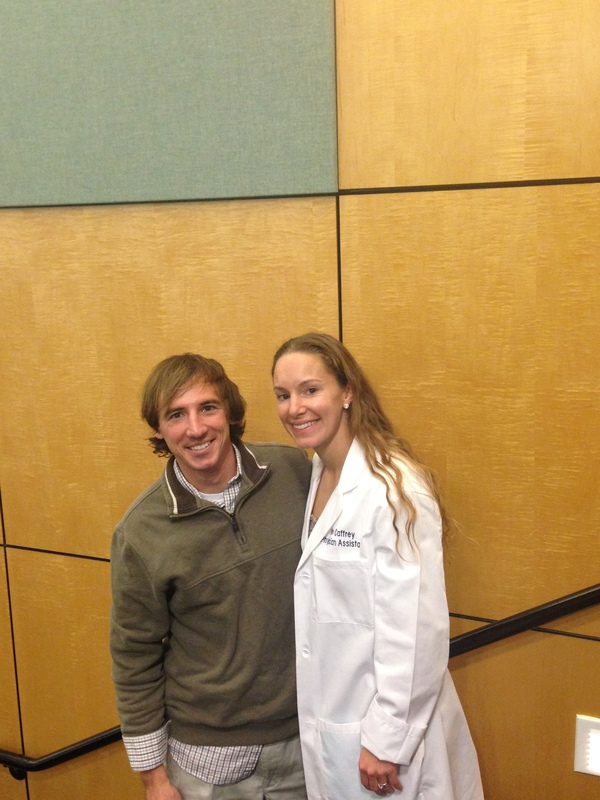 Kevin and me at my white coat ceremony for graduation. There are so many people to thank for this accomplishment, and Kevin and I look forward to sharing your generosity with others! This entry was posted in Uncategorized and tagged clinicals, generosity, pay it forward, Physician Assistant school on January 28, 2015 by caffreem.